OMW | What Does OMW Mean? The most common definition for OMW is "On My Way". The meaning can be taken literally. In other words, it is used to tell someone that you are en route to their location. The abbreviation ONW is particularly common in texting apps (e.g., Whatsapp) and in online gaming forums (e.g., League of Legends). Person A: Have you left work yet? OMW, your hair is bright red! Sarah accused me of an OMW when I was moving the bed. 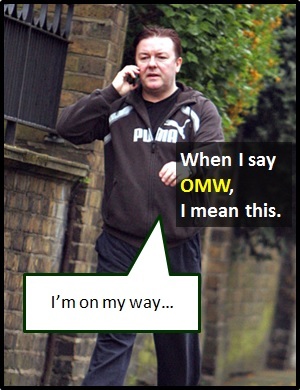 When OMW means "On My Way," it is a prepositional phrase. However, it is mostly used like a standalone sentence meaning "I am on my way". OMW is an initialism abbreviation. This means it is pronounced using its individual letters (i.e., Oh Em Dublyu). As saying the letters is harder than saying the full version, the abbreviation OMW is used for efficiency in writing and not efficiency in speech.